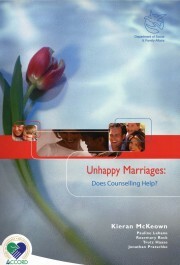 Home › All Publications › Unhappy Marriages: Does Counselling Help? Based on the analysis of over 3,400 individuals that participated in marriage counselling, this study looks at the factors that contribute to unhappy marriages and addresses the question of how much marriage counselling assists in overcoming these. Study commissioned by ACCORD and the Department of Social & Family Affairs, 212 pages.